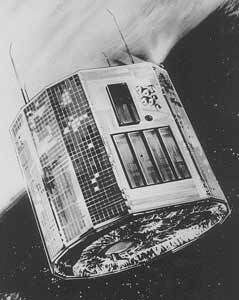 Ariel 5 (UK 5) was the fifth scientific satellite in a U.K./U.S. collaborative space research program. The satellite was the fifth such satellite and the third to be wholly built in the United Kingdom. It carried six experiments (five U.K. and one U.S.) for cosmic X-ray studies that measured the spectra, polarization, and pulsar features of X-ray sources. The tasks of the scientists with experiments on the UK 5 satellite were, in general, to improve the accuracy of position measurement of X-ray stars and to measure their energy spectra. The spacecraft was spin stabilized. Two experiments scanned the sky perpendicular to the spin axis, while four experiments pointed parallel to the spin axis. When fully equipped, UK 5 weighed 300 lb. The satellite was approximately cylindrical in shape, 38 in. in diameter by 34-in. high. UK 5 was launched into a quasi-circular orbit at a height of 400 to 500 km. During operation in orbit UK 5 spun at a rate of 10 revolutions per minute. The satellite was designed to operate over a restricted range of solar aspects with the sun within 45 deg of normal to the spin axis. To enable various parts of the sky to be observed, the pointing direction of the spin axis could be altered by a pulsed gas jet system. The UK 5 data system generated sector information with respect to the sun's position to enable the position of X-ray sources to be determined. Data were stored on board the spacecraft in a core storage and dumped to ground stations once per orbit. All satellite operations were directed from a control center at the Appleton Lab, U.K.